My husband gave me a PMP (portable media player) for our wedding anniversary. 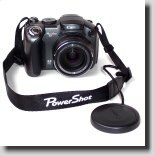 I love tech toys and this one is no exception. I decided I wanted a special case for it that I could wear as I went about my day. Now I can listen to podcast and music regardless of where I am or what I’m doing. The construction of the case/carrier really falls under more than one category, so I will be dividing this tutorial between Felted Finery and Fabrications. You can make these little case/carriers any size you like. I think they would make very nice gifts for anyone with an iPod or MP3 player. Hoop a circle of organza in a color that is close to the color of your wool roving. 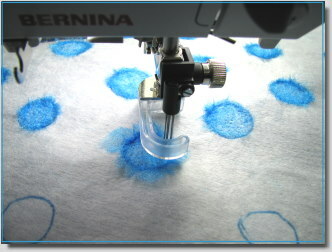 Although it’s not necessary, it helps to mark your small circular flower centers on the organza. Use a color that matches your roving since markings can show on the surface after felting. Place your hoop under the needles of your felting machine and position a small amount of roving on the outside edge of one of your marked circles. Working in a circular motion, slowly tack the roving down. Pull a little more roving and work around the previous roving circle. When you are happy with the size of your flower, give it a more thorough needle punching. 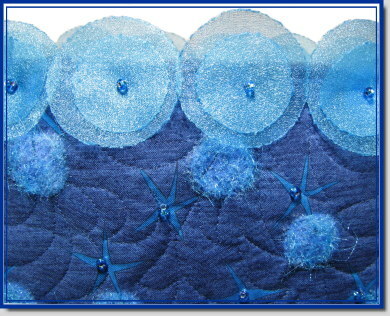 For the flower center, cut a circle of organza about three times larger than the bare center of your felted flower. Remove the organza base from the hoop and turn it to the wrong side. Place the cut organza circle over the center of your flower and slowly needle punch it, holding the edges of the organza so that it doesn’t bunch up under the needles. That completes the felting stage of this project. With the center motif completed, we now turn to the two red fluffy flowers. You will need some cotton fabric for the base of the flower and some organza in the same color. I used red, but you can choose any color you like for your flowers. You will also need some perle cotton #3 or #5. You may have noticed a new widget in the sidebar. I’m not so sure I like the color so that may change, but within the box you will see a JPG file. I have uploaded the flower template file (ib1.jpg) for you to download. If you have a graphics program, you can adjust the size to fit your needs. From time to time I will upload files for you to use with the tutorials. If you see an empty box, it means your browser can’t display the widget. For example, it doesn’t display in Mozilla using a Linux OS. I’m sorry, but I have no control over it. For those who can use it, you are welcome to download any files I place there for your personal use. Cut two pieces of red fabric a little larger than the flower template. Back these with a fusible such as Wonder Under. Place the flower template on the paper side of the fusible and draw around it with a pencil. Next, cut the flowers out. Peel the paper backing off of your fusible and position your flowers wherever you would like them. Press according to manufacturer’s directions. I wanted my flowers to have a little more glitz, so I topped them with red organza. You can skip the next step if you like. Cut two pieces of organza a little larger than your flowers. Lightly spray the back of each piece with a spray adhesive such as 505 and place them over the fused flowers. (1) Attach a cording or braiding foot and slowly work your way around the flower, couching the perle cotton. (2) Attach a free motion couching foot and couch the perle cotton around the flower. When using the Bernina Free Motion Couching Foot, I like to move my needle one position to the right and set the machine on a zig zag stitch at about 0.5 stitch width. Perle cotton #3 works best with this foot. (3) Sew around the edge of the flower using a regular straight stitch (or free motion stitch around it). Wind your bobbin with perle cotton and work around the flower from the reverse side of your project, using the previous stitching as your guide. Always use a separate bobbin case that you can adjust for specialty bobbin work. Test your bobbin tension before working on your project. To neatly secure the ends of the perle cotton, attach an open toe foot and set your machine on a zig zag stitch. Clip the beginning tail of perle cotton right where your stitching began. Wrap the ending tail around the back of your needle (from left to right) and pull the perle cotton towards you. Zig zag stitch over a small portion of the tail, take a few securing stitches, and then clip the remaining tail off. 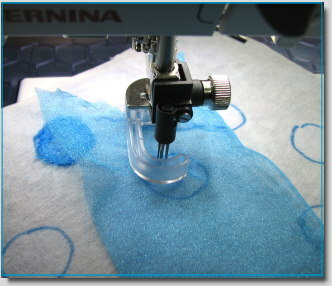 Place your project on a glass surface (or any other heat proof surface) and burn away the outer edges of organza with a stencil cutter or wood burning tool. Do this in a well ventilated area. In part three, we will give the flowers a nice fluffy center. I have no idea why, but I’ve had polka dots on the brain for a few weeks now. I even combed through fabric stores looking for dots that didn’t overlap and were spaced in such a way that I could free motion quilt between them. Well, I never found any. Then, while working on another quilt and rummaging through piles of prospective fabrics from my own stash, low and behold I found just what I was looking for. For this fiber play, you will need any print that has shapes into which you can felt organza. 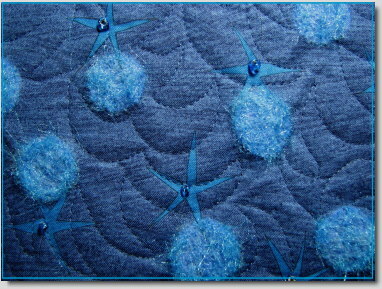 Owing to the rounded configuration of needles on felting machines, simple shapes without sharp points work best. Of course, on some machines and attachments you can remove needles. You will also need polyester organza that matches or compliments your fabric. I used the additional embellishment of glass beads for the little dots in the star fish. 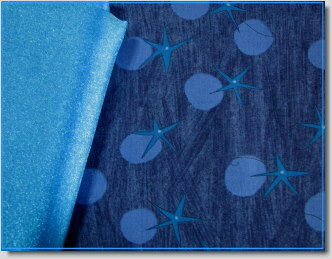 Cut your fabric to any size you like and back it with a heavy stabilizer or interfacing such as Decor Bond. Next, lay your fabric wrong side up over a light box (or hold it up to a window) and mark the outlines of all shapes you want to felt. Remember that the color you use to mark your shapes could migrate to the front of your project, so choose a matching color or use chalk. Cut your organza several inches wider than your shapes or hoop your fabric and organza together. 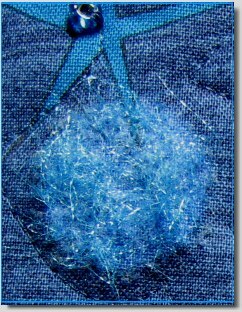 Machine needle felting compacts fibers and your organza will shrink rapidly under the needles. Beginning in the center, slowly tack down the organza while securing it with your fingers (if it’s not hooped). Then lightly needle felt the shape. For this project I used the Bernina Needle Punch Attachment, and it didn’t take more than a few seconds to do each circle. As you finish your shapes, cut away excess organza with a pair of appliqué scissors or small craft scissors. I did one more felting around the circumference of the circles after each trim. When all of your shapes are complete, sandwich your top with batting and backing and then free motion quilt between the felted shapes. I needed an edge trim for my felted piece, so I gave it some thought and decided to cut circles out of organza with a heat tool. I use this method when I embroider on organza, so I assumed it would work just as well on simple shapes. First, do this in a well ventilated area. Place a Teflon pressing sheet or heat resistant liner on a secure surface (I use a Silpat purchased from a cooking store). Pick out some metal or wood shapes as your patterns. 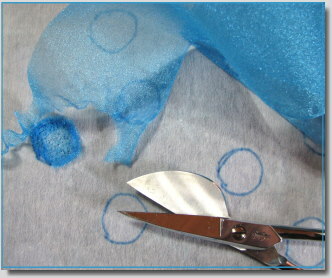 Lay one shape on top of the organza and trace around it with your heat tool. The organza should melt immediately, leaving a non-fraying edge to your shapes. There are many decorative things you can do with these organza cutouts. 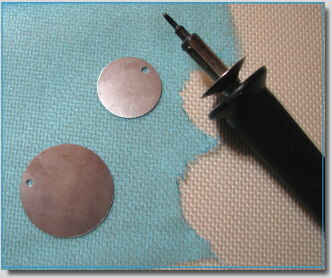 I cut circles in two sizes, layered them, and then attached them to the edge of my project with beads. I hope you will look through your fabric stash and use this technique to transform a plain print into something eye-catching and unique. Have fun!